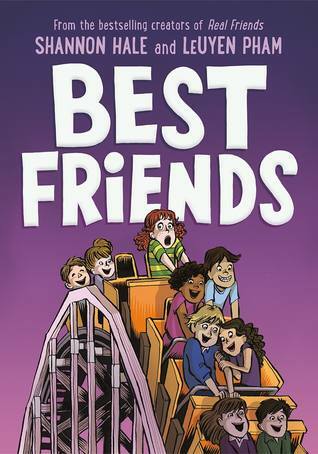 Sequel to Shannon Hale’s award-winning graphic novel memoir, “Real Friends”, this new graphic memoir picks up where “Real Friends” left off. As Shannon grows a little older, the rules of friendship always seem to be changing, leaving her guessing and trying her best to just keep up. “Best Friends” shares its predecessor’s frankness, compassion, and enthralling, heartfelt visual storytelling. Junior high, as it turns out, is quite the roller coaster. I love to feature brand new, buzzworthy titles on this post, but I cannot help but feature this graphic novel this week. I loooooooooooooooved Real Friends. LOVED. I’ve read it several times and it was easily my first choice as I was deciding which graphic novels I was going to order for my new elective. I’m so excited that it is getting a sequel and am dying to get my hands on this. I do like Shannon Hale’s stuff, at least the ones I’ve read.